"Before I get out of this world, I want to see exactly what I'm getting out of it." The garden courtyard of Riad L’Orangeraie. After a recent trip to Morocco, I came home telling stories about the gorgeous riad that I stayed in in Marrakesh, but I had plenty of friends and family looking at me funny when I said the word “riad.” So what is a riad, also spelled ryad, you might ask? A riad is a traditional, two to three story Moroccan house, centered around a courtyard, with all of the rooms, doored or not, facing inward. They were designed this way to emphasize privacy. Since many of Morocco’s cities are quite compact and the streets very busy, riads focus everything inside, allowing a family to have a quiet, private space within a bustling city. 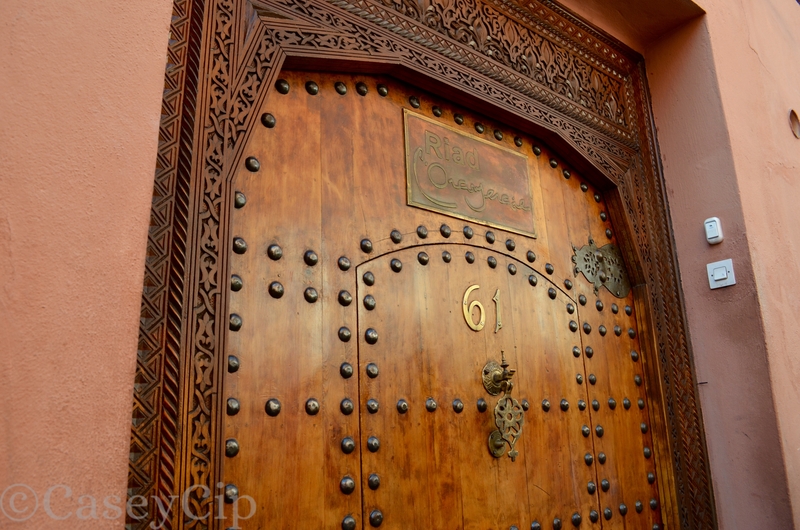 Walking through the winding, maze-like streets of the Medina (the walled-in old city of Marrakesh, dating from the 11th century) you’ll see no windows peering out into the stone walkways, and though the doors are lavishly decorated they’re rather inconspicuous. Yet the lack of outward windows doesn’t mean that riads are just dark fortresses on the inside. In fact it’s just the opposite. Riads get a ton of light from the massive courtyards; the sun shining down through the open roofs and each room soaking it in through their central-facing windows. Wandering through the Medina, passing the souks (the markets), and making your way around, the thick red walls don’t give away the fact that just through many of these doors lie gorgeous, Moroccan paradises. The courtyard of Riad L’Orangeraie. The open courtyards of a riad also allow for some green space within what can be quite a dusty, congested city. The red walls of Marrakesh can be really lovely, but it’s also nice to be able to escape to a bit of nature when you want to. The word riad, or ryad, in fact is the Arabian term for garden. These courtyards are also incredibly cooling, with temperatures much lower than on the crowded streets. In recent years, many traditional riads have been turned into boutique hotels, with plunge pools taking up some of the inside garden space. It’s not common for family riads to have a pools, but when one has been transformed into a hotel, a refreshing pool is definitely a plus. The courtyard pool at Riad L’Orangeraie. The riad I stayed in for the duration of my trip to Marrakesh was called Riad L’Orangeraie and it was absolutely stunning. I stayed in the Cinnamon Room, which had a red theme and a bathroom up a set of stairs. The riad also uses the traditional “tadelakt” plaster, which is made with lime from the Marrakesh Plateau and rubbed with olive soap. “Tadelakt” means “to rub in,” and the plaster is used as the coating of palaces, hammams, and bathrooms in authentic Moroccan riads. The Cinnamon Room. Photos courtesy of Riad L’Orangeraie. There’s also another type of traditional house in Marrakesh called a dar, and you’ll see just as many updated hotels with the name “Dar Something” rather than “Riad Something,” however there’s not much difference between the two, at least not any more. 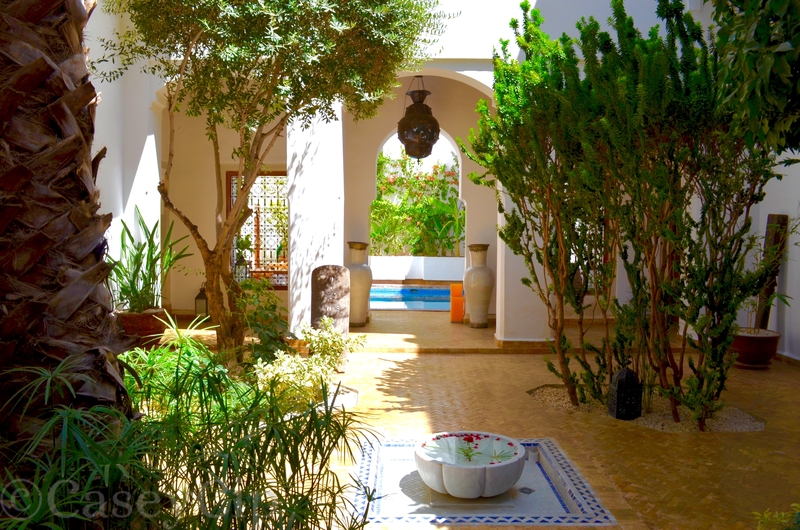 Traditionally, a dar is slightly larger, and has a fountain as the central focal point of the courtyard, whereas a riad is more about the trees and greenery. Riad L’Orangeraie had a lovely little mini-fountain to accent the trees, so like I said, the two have become somewhat interchangeable in the recent boutique hotel boom. 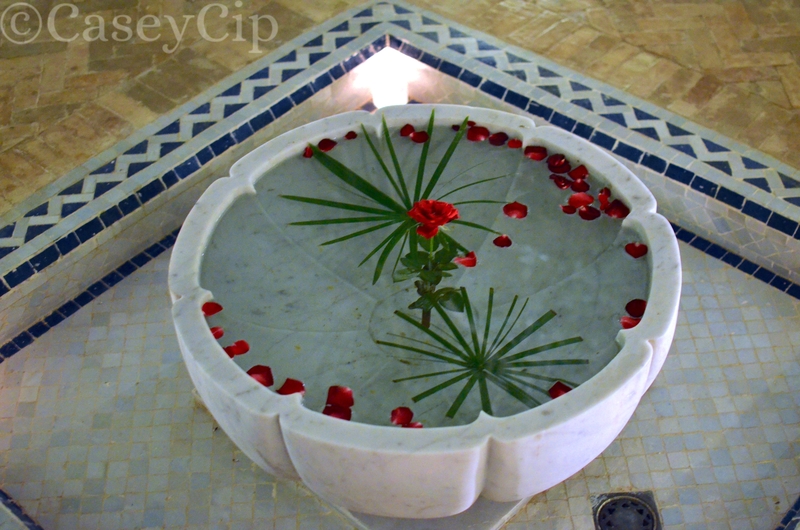 Roses float in the mosaic fountain of Riad L”Orangeraie. I was lucky enough to see a few riads on my trip to Morocco. 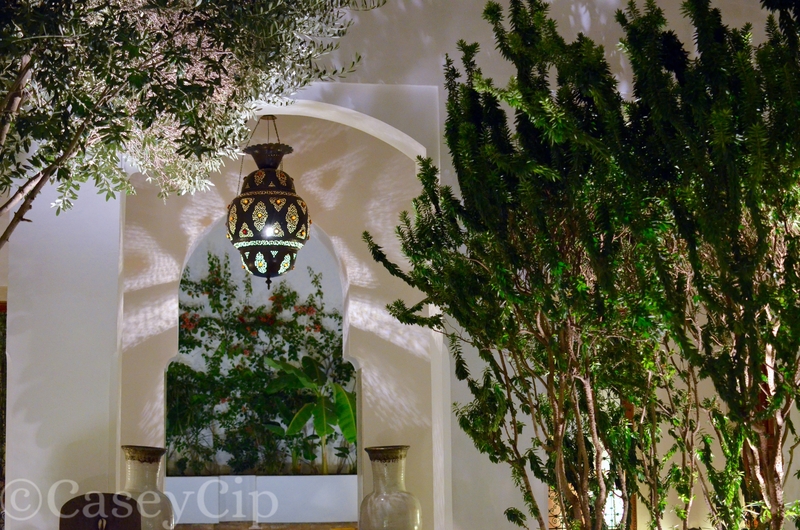 One was the private home of our Souk Cuisine cooking instructor, her much smaller open courtyard transformed into a multi-station kitchen space for her classes, and the very elaborate Riad Wow, which also featured a chic rooftop bar. 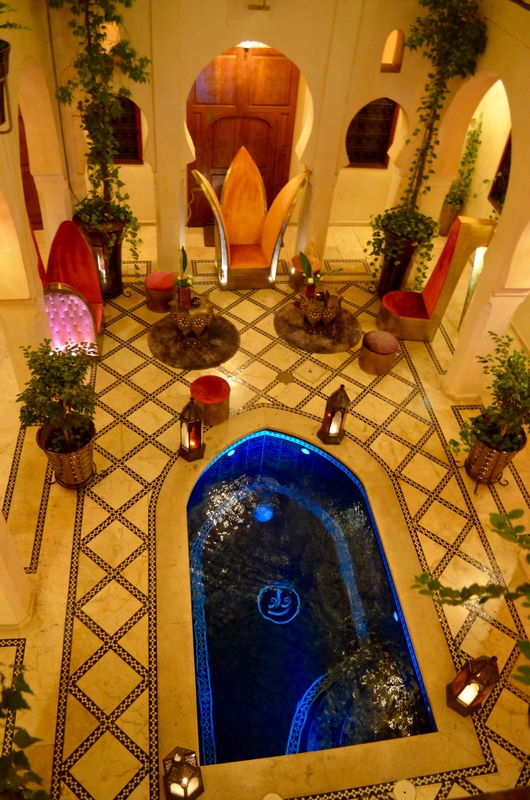 The chic pool and courtyard of Riad Wow from above. If you’re heading to Marrakesh, you’ll no doubt look at multiple riads and dars to decide where to stay. I definitely recommend staying at one within the Medina, as opposed to a more traditional hotel that lies outside of the Medina walls in modern Marrakesh. A beautiful tribute to the beautiful riads of Marrakech, namely our beloved Riad l’Orangeraie! You taught me things in this piece I didn’t know! Thank you!! Lisa D. on What is a Riad?